Are mermaids welcomed at your house? If so, you might need this new sign. Mermaids Welcome! It would make the perfect welcome sign for your guests at your coastal home or beach house! Place it inside or outside. This piece is made mostly of cast iron. 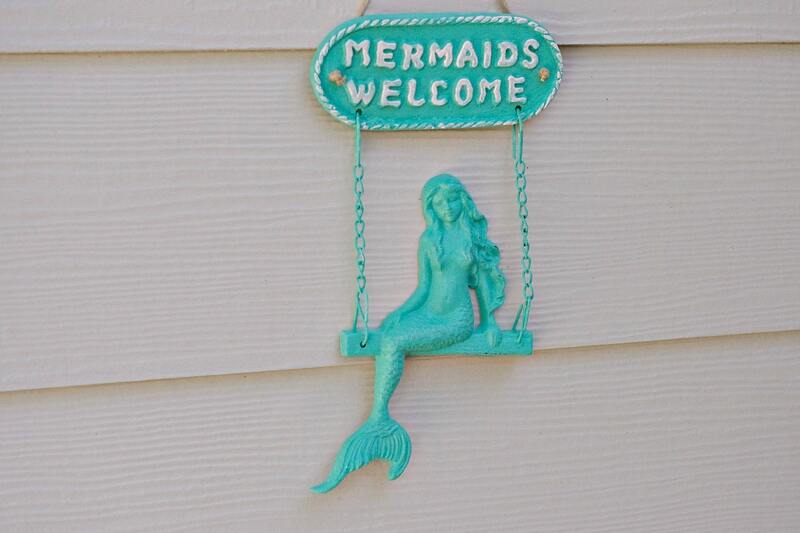 The sign and mermaid are cast iron and there's a chain that holds her in her mermaid swing. We always prime our pieces thoroughly to minimize the chances of rust. Then we hand paint each piece 2-3 times with acrylic paints. After all the painting has been completed, we give it a clear glossy sealant to keep the piece looking beautiful for years to come. Hangs easily with one nail using attached twine (shown) or mount with two screws for a more permanent mount. This sign was painted in Seaside and the letters were painted in white. Also available in any of our 20 colors - see last photo - specify colors at checkout. Allow 3-5 business days for painting process. Such a cute addition to my beach themed bathroom. Thanks again!